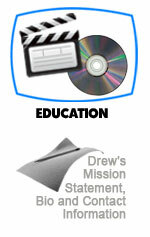 Drew is an incomparable PC user. There are few of his kind around. Lightning quick. Super smooth. Cuts through everything like butter. 18 years ago he birthed a system which he taught in a live setting. He envisioned putting it together for mass distribution, but life got messy. Drew finally dug in and redeveloped his program ground-up. It became something far grander than what he had first imagined. After five months of round-the-clock work, he launched his online course Use Your PC with Your Keys in February 2016. It's the only course of its kind, and the only full treatise on the subject.